An unforgiveable omission from this site for many years, I have finally decided to create a small page here to talk about my favorite game. Yes, I've spent far more time playing Tetris than any of the Civ games, possibly as much as all of them combined. A quick word of explanation for those who aren't familiar with Tetris (does that even apply to anyone?) Tetris is a puzzle game in which you maneuver various blocks of four tiles, known as "tetrads", into combinations that fit together. Tetrads (or pieces) fall from the ceiling into a cylindrical playing field of 10 tiles across by 20 tiles high. When a horizontal column of ten blocks is created, it is called a "line" and disappears from the screen. If the stack of pieces ever reaches the top of the screen, you lose and have to start over again. The longer one plays, the faster the pieces drop from the ceiling, and the harder it is to create lines without dying. The gameplay is both highly simple and highly addicting. I'll also note here that the two primary game modes include "Type A", an unlimited game mode in which you play until you are killed, and "Type B", where you try to achieve 25 lines, often with a great deal of starting clutter on the screen. What I'd like to do here is first talk about how I encountered the game and why it's kept me playing for so long, before finally moving on to some of the current scores that I'm pursuing. 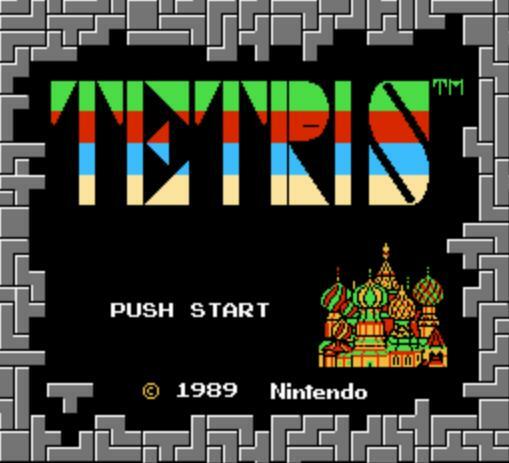 Since the NES version of Tetris was the first version of the game that I owned, it received the most playtime growing up. I quickly became proficient enough to beat all of the challenges in Type-B, up to and including 9-5 (the highest default setting in the game), and thus spent the bulk of my time trying to beat personal high scores in Type-A. By the time I was 15, I could routinely hit 400,000 points, but that was essentially my personal ceiling for a very long time. It wasn't until I was attending college in roughly 2000 or 2001 that I managed to break through and top the 500,000 mark for the first time. By now, I was playing an emulated version of the original cart on my PC, the actual game cartridge long having since given up the ghost. My first, and so far only, 700k game in NES Tetris. This was the culmination of almost 15 years of experience, and thousands upon thousands of games played. It also ranks as the second-highest score ever, according to the official records at Twin Galaxies (although there's an excellent possibility that others have put up tremendous scores that are not recorded there). Maybe this seems a little silly to someone reading this, but it was (and is!) a big deal to me. Every version of Tetris is a little different, and they each have their own quirks that you have to get used to. NES Tetris is noteworthy first of all because the pieces are what I call a little bit "sticky"; in other versions, you can often graze another placed piece and continue moving or rotating the current piece, but not in this game. If you make any contact with a placed piece, your piece becomes stuck and the next one begins falling from the ceiling. The lines also disappear almost instantaneously in this version (in the Gameboy version, there's a pause of about two seconds for the line to clear) causing the action to move very quickly on the highest settings. Also noteworthy are the steep jumps in speed; level 9 is enormously faster than level 8, and level 19 is a similar jump up from level 18. For no apparent reason, levels 20 through 28 are all the exact same speed (they all equal the same speed as level 19), then at level 29 the pieces jump again to an impossible speed. And I do mean impossible; at level 29, the pieces move so fast that you can't get them to the sides of the screen before they reach the bottom. So for practical purposes, NES Tetris is a race to see how many points you can score before reaching the closing curtain at level 29. I've never seen anyone get more than 290 lines, leading me to believe that this really is impossible without cheating in some way. I'd like to record a video demonstrating some high-level play in this game; I can score the max possible points in Type-B, which I hope to add here later for viewing pleasure. 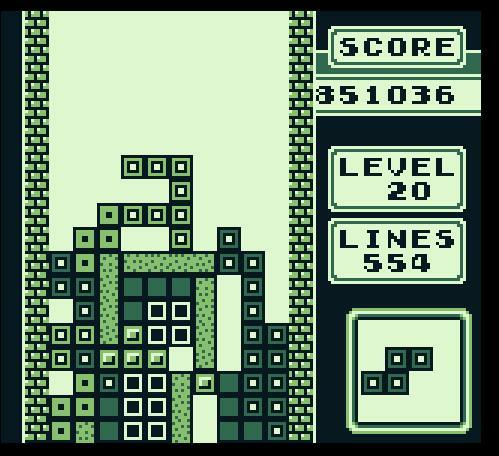 For now, however, I'm going to switch focus to the Gameboy version of Tetris. 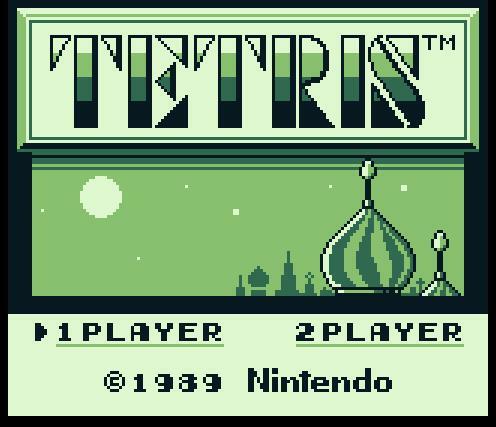 Tetris on the Gameboy is graphically inferior to the NES, but the gameplay is so similar it ultimately makes little difference. About the only thing that I miss is not having the count of each of the six pieces on the left side of the screen (see the above screenshot); this mostly lets me complain when I'm not getting enough I-pieces, the straight-line blocks which are the only ones that can knock out four lines at a time - known as a "Tetris". As always, there are some differences between the versions. The biggest one that jumps out is the fact that Gameboy Tetris has a playing area of only 18x10 tiles, instead of the standard 20x10 tiles in essentially all other versions. That extra height might seem like a trivial detail - umm, it's not! You have fully 10% less room to work with, and believe me, it's noticeable right away. After many months of playing NES Tetris, I swapped over to the Gameboy and kept wondering, "why am I dying so easily?" There was a reason why I was struggling! The other major change is the rate at which the completed lines disappear off the screen. In NES Tetris, they clear almost instantaneously, while on the Gameboy there's a noticeable delay. This definitely makes the game easier at times, although it can also throw off your timing if you aren't used to it. Unlike NES Tetris, which places the big difficulty leaps on the level 9s, Gameboy Tetris has a much smoother incrementing scale of increased speed. 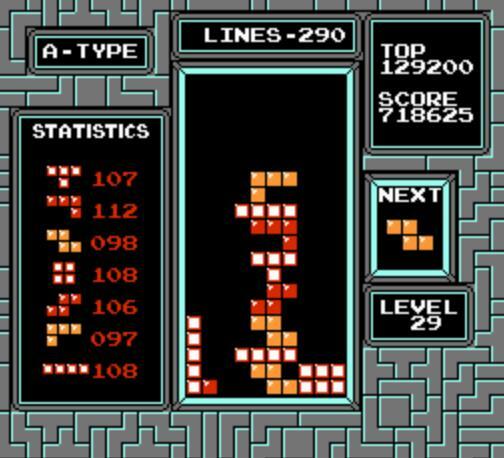 However, while NES Tetris scales all the way up to the (impossible) level 29, Gameboy Tetris stops at level 20. That's it; you can never reach a higher level no matter how many lines you put up. Without timing the two, I'd say that the level 20 in Gameboy Tetris is slightly faster than levels 19-28 in NES Tetris. They're both playable, although too fast to play for the big four-line score. 2) Another 100 lines at levels 10-19, slowly increasing in speed. Still going for Tetrises here, but more cautiously. 3) Holding on for dear life at level 20. There's no upper ceiling here, so the score is theoretically unbounded. I'm particularly pleased with that top score. Not just because it's my best - because it breaks the official world record for both points AND lines! The truly amazing thing is that I recorded both of those top two scores on the same day, Feb. 11 2008. After weeks of trying, I finally broke 600k - and then I fired off an incredible 850k game later the same day! I simply hit a groove on level 20, and managed to pull off a full 355 more lines. Athletes sometimes talk about being "in the zone"; maybe it's silly to use that expression here, but I was feeling something while playing that game. I've sometimes felt that way when recording "AAA"s in DDR as well, just a strange feeling of inexplicable confidence where you somehow KNOW that you're not going to make a mistake. Whatever the case, I absolutely shattered my best mark, and made a mockery of the official Twin Galaxies records. I have 200 more lines and 250,000 more points than the official records! Now, a word of moderation after that fun salvo. I say the "official world record" because there have been some recorded games that outscored the ones listed by Twin Galaxies, yet failed to meet their stringent qualifications. 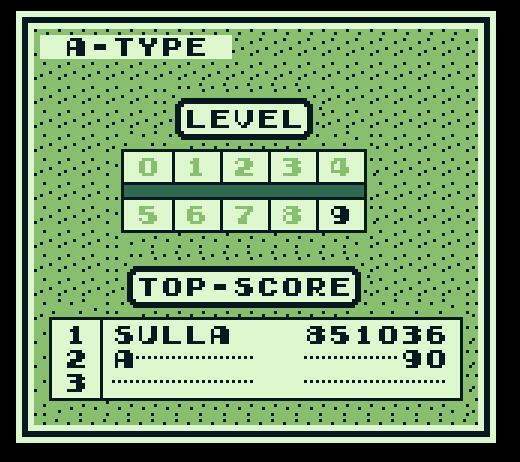 My own scores are ineligible because I'm using an emulated version of Tetris, instead of the original cartridge. (And even if I were to dig up my ancient Gameboy unit, my digital camera can only shoot 8 minutes worth of film - not enough to record a full Tetris game anyway.) The unofficial record holder for Gameboy Tetris is DanZ (Spectre), who actually maxed out the Tetris score at 999,999. DanZ's game is an absolute masterpiece, unbelivably audacious yet managing to stave off defeat at every turn. With all respect to DanZ, I came extremely close to replicating his amazing achievement. Another 100 lines would have seen me max out the Tetris gauge as well. That is my ultimate Tetris dream, the perfect 999,999 score readout. I've gotten close now. Can I pull it off? I'm certainly going to try! That second picture is there to let you know I didn't pull this from some random person on the Internet and try to steal credit. As with NES Tetris, I'd like to try and record something for posting here. For now, I'll end with this last thought: Tetris B music. Anything else won't cut it! If you're feeling nostalgic, you can play Tetris Online at ReadersDigest completely for free. Check it out.